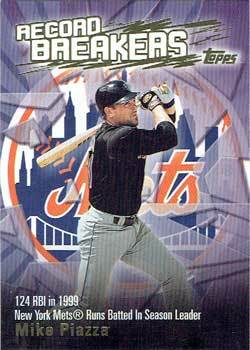 Since it celebrates Piazza setting a new Mets’ single-season RBI record in 1999, I initially thought it was a 2000 Topps baseball card. It’s actually from 2002. By the early 1990s, Record Breakers had fallen out of fashion but at some point after I’d gotten away from baseball card collecting, they came back as inserts. Only in the revived format, they were a vehicle to feature star players rather than chronicle the previous season. 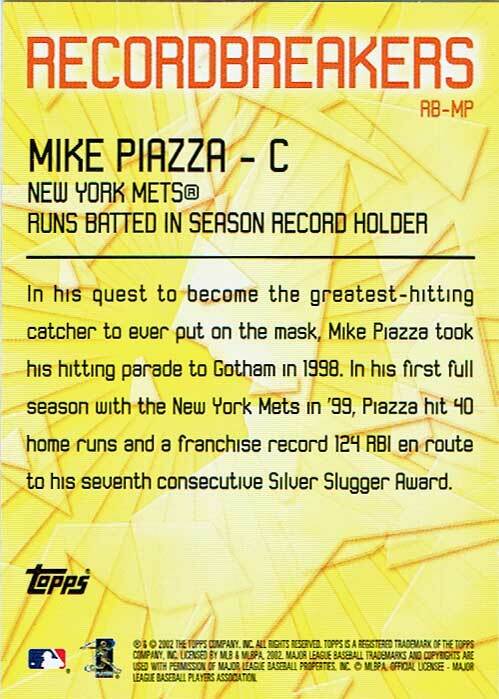 I like the card front, which features a photo of Piazza in front of a giant Mets logo. I’m not sure what the purple stuff is supposed to symbolize, but it’s definitely got the “broken” look going so it’s appropriate for a “Record Breakers” card. I’m less sold on the minimalist back, but at least the writeup is in big enough text to read and stands out on the yellow background.